When it comes to trends and twists in food, desserts have been the test subject of choice in Cairo, where you can find everything from ice cream in a donut cone and melted cotton candy crème brulee, to ‘Freak Shakes’ and, of course, Oriental and Western mash-ups. But that doesn’t mean that there’s no space for the classics, as Ovio has shown with the introduction of breakfast pancake menu – because who doesn’t love pancakes? Ovio offers a crowd-pleasing variety of pancakes that are available till 1PM, which we tried at the restaurant’s Maadi branch. Out of the four kinds of pancakes on offer, we tried three – strawberry, caramelised banana and chocolate – with our fourth being plain with just maple syrup. 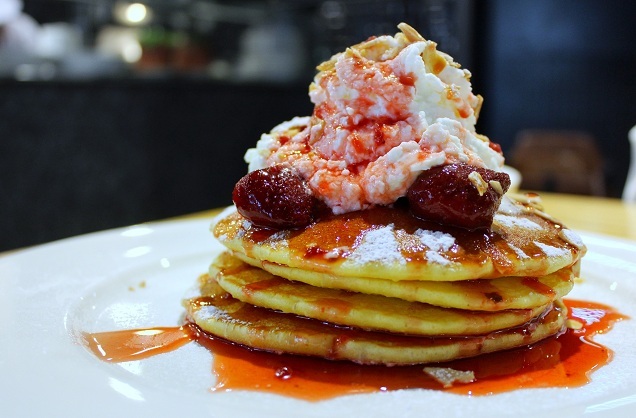 We started our pancake fiesta with the Strawberry Pancakes (36LE). Four pieces are topped with marinated strawberries, whipped cream, sliced almond, powdered sugar and served with a small bowl of strawberry syrup – and it was flawless. The well-executed pancakes had a soft and airy interior, a beautiful colour on the outside and handled the syrup perfectly without getting soggy. As for the toppings, the richness of the whipped cream, the sweet and fruity strawberries and the nutty crunch from the almond, all worked perfectly. We loved the diversity of textures and it was a great pancake version of strawberry shortcake. This second beauty was the chocolate pancake; the stack was topped with chocolate shavings, powdered sugar and served with a jar of chocolate sauce to be poured on top. What makes this different from the rest is that the pancakes are actually stuffed with chocolate, which didn’t effect its beautiful texture. To recap, that’s melted chocolate, chocolate shavings and chocolate stuffing; yes, the chocolate pancakes are definitely a great way to satisfy your chocolate cravings. 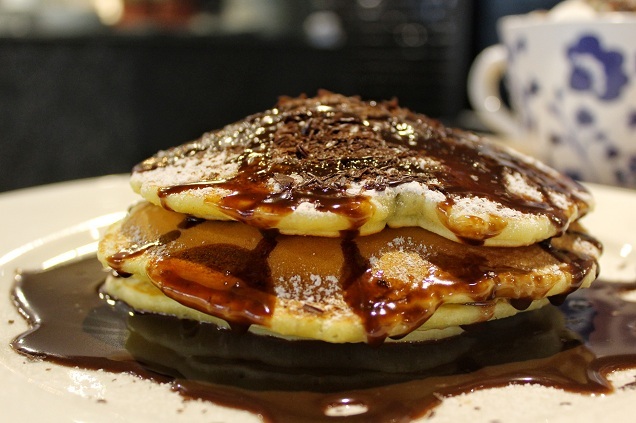 The banana caramel ones, meanwhile, were another fluffy stack of plain pancakes, but with honey caramelised bananas in between each pancake, topped with more caramelised bananas,and served with a jar of cinnamon-chilli chocolate sauce. Besides the bananas being a bit mushy, there were plenty of interesting flavours in the mix; it was bursting with cinnamon flavour which worked well with the cinnamon and not-so-chilli chocolate sauce, but we felt like the caramelised bananas were calling for salted caramel sauce not chocolate, especially considering there’s already a chocolate version on the menu. Overall, Ovio’s pancakes menu was a very smart move, not least because it’s rare to find good quality pancakes in Cairo. But with decent variety and interesting flavours thrown into a unique, European atmosphere and dining experience, it’s a winning formula. How can we be so sure of its success? The whole place was packed with people devouring pancakes. The real question is this: who are all these people that wake up that early?! Check out our full review of Ovio for more on the rest of the restaurant's menu. It’s hard to pick – we loved everything.